Assistants in ESO are like pets but they perform a function too. They are arriving with Update 9 (Thieves Guild, March 2016) and the first one will be as a reward for completing the Thieves Guild DLC quest line. You can activate Assistants like pets, they will follow you around and you can talk to them. You can only have either an Assistant or a pet active at the same time. They’ll work throughout Tamriel except for Cyrodiil. This Baandari Pedlar is on hand whenever she is needed (except in Cyrodiil), and will fence any of your stolen goods for you – but she’ll take a cut of your profits. You can call her up on the Assistants tab in the Collections UI. She is required after completing the Thieves Guild quest line. 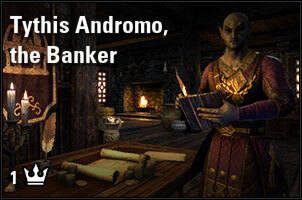 You can buy a banker NPC Assistant called Tythis Andromo the Banker on the Crown Store. This Assistant will be able to bank your items for you while out and about. 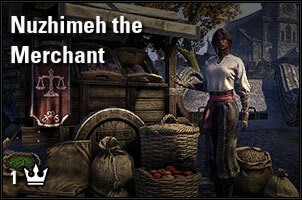 You can buy a vendor merchant NPC called Nuzhimeh the Merchant on the Crown Store. This Assistant will let you sell things to her and will be able to repair your gear. When will the banker and the merchant be available on the console version? They are live now. 5k crowns each. Contrary to what is posted here the merchant DOES NOT repair armor.